Health care reform advocates throughout the state were dealt a major setback as the governor's health care reform package failed to make it out of the Senate. On Monday, Jan 28th, the Senate Health Committee voted to oppose the Governor and Speaker Nuñez's health care proposal, which would have insured 5.1 million uninsured Californians, including 800,000 children. The proposal was to be funded through an initiative on the November 2008 ballot that sought to impose fees on hospitals, employers, employees, and a $1.75-a-pack tax increase on tobacco. Only one of the committee's 11 members voted in support of the bill. The committee members cited the current budget crisis and a report from the Legislative Analyst's Office (LAO) as the primary reason for opposing the plan. The LAO's report concluded that the proposal was fraught with financing weaknesses and would greatly exacerbate the state's existing budget problems. Given the uncertain climate for health care reform, First 5 LA has stepped in to fill the coverage gap for L.A. County young children by extending funding for Healthy Kids through June 2009. The Healthy Kids insurance program ensures that children 5-years-old and under receive needed immunizations, doctor well-child visits, and dental care among other services. 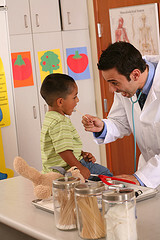 Moreover, children ages 6-to-18 already covered under the local Children's Health Initiative will remain enrolled through April of 2008.